The reception begins with the speeches. Before dinner is served, all of the guests take their seats at their respective tables and settle in to listen to the bride and groom’s closest friends share a few words. One of the bridesmaids stands up first to share her speech with the newlyweds. Her hair is swept back in a loose updo, and a gorgeous earring dangles from her ear. In the light of dusk, the pale pink of her dress looks soft. The bridesmaid holds the microphone to her lips as she shares her favorite memories and offers her best wishes to future of the bride and groom in their new life together. 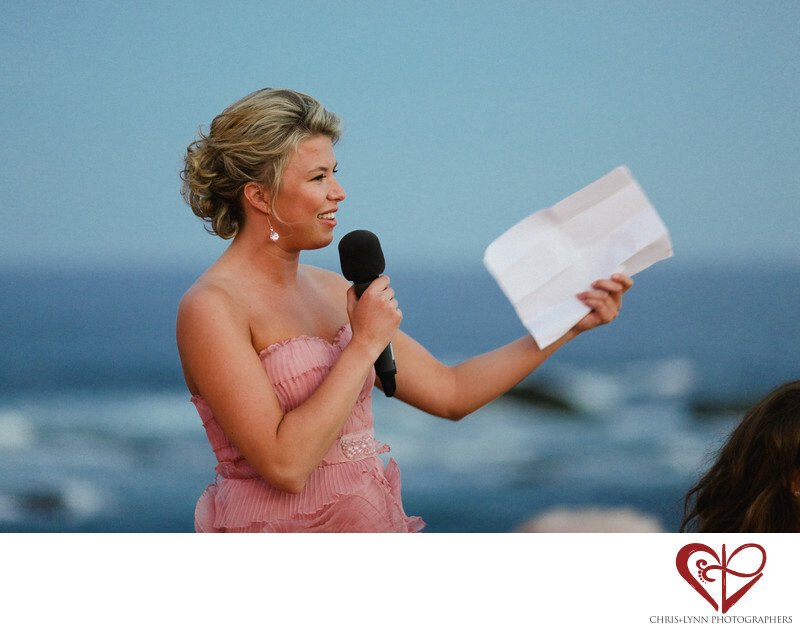 With her written speech in a sheet of paper in her hand, the bridesmaid speaks from her heart, looking directly at the bride and groom. Her heartfelt words move the entire audience.